Herd dynamics and interactions are fascinating. Big upheaval here at the Rancho. 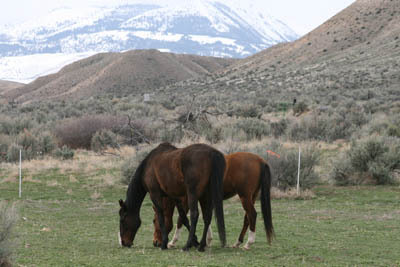 While staying here in Owyhee over the winter, I had two 'herds.' Finneas and Dudley (the Hoodlums) made up one herd (with Finneas being the Boss). 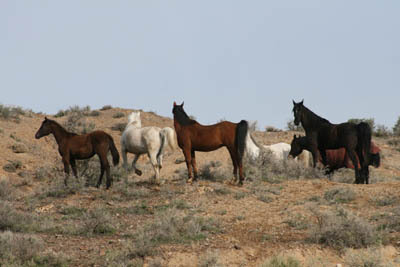 The other herd consisted of Jose, Mac, Stormy, Kazam, Huckleberry and baby Smokey. They didn't really have a Boss, other than Jose being the Social Director. Jose/Kazam/Mac sort of had a triangle thing going on, but they all really got along. 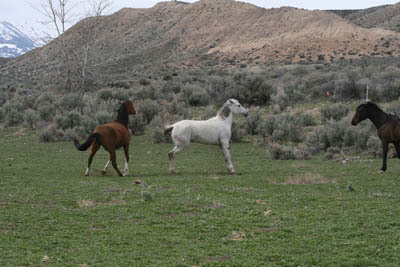 I turned both herds out together occasionally, but even then, the 2 herds often retained their separateness - the two Hoods would often go off and do their own thing. 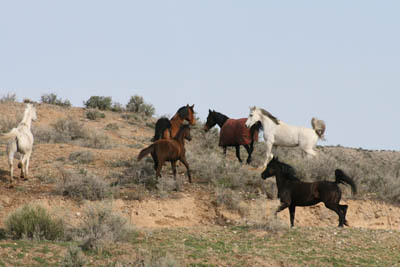 At the same time, the three Arizona horses came home: Rhett, Sunny, and the new Batman. 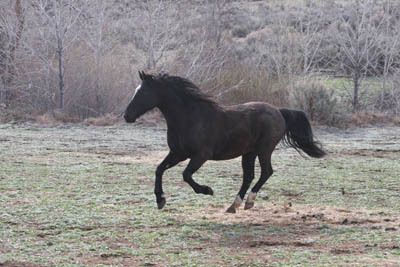 Batman first joined the scene on the trailer ride down to Arizona; those three bonded like glue for 4 months down south, and they were kept separated from the others for a few days when they arrived back home in Owyhee. 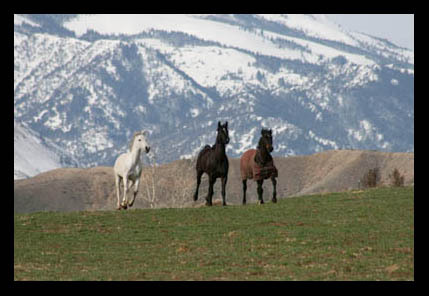 The last several years, Rhett had been the Big Boss of the entire Owyhee herd; he and Jose and Mac were the Three Musketeers. Rhett was a good Boss, obviously in charge, but never had to do more than pin his ears at someone and they moved away. He never kicked or bit anybody. Now, Jose couldn't quite understand why his buddy Rhett was back, but was separated from him by a fence, nor why he seemed to be a member of the Three Stooges now. 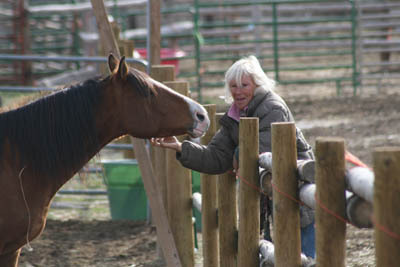 We put Stormy in a pen with him for a few days so he'd have a companion while he got to know the other horses over the fence. Stormy was so happy to have one horse besides baby Smokey that he could boss around... though it wasn't long before Tex figured Stormy was bluffing, and he didn't take Stormy too seriously. Tex bonded right up with his new pal, and Stormy appeared to like his important new Big Brother status. 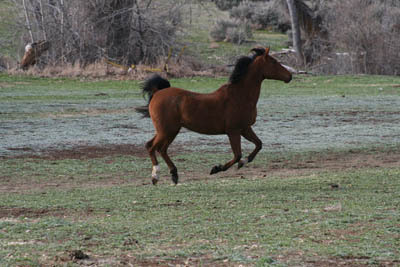 - renowned Owyhee endurance horse. 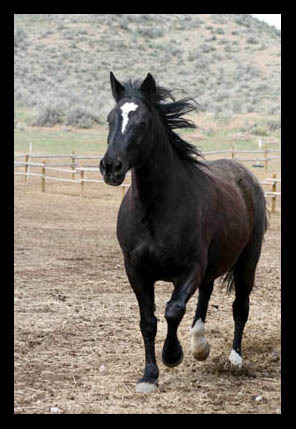 Krusty, 20 years old, is a huge stout black half Orlov Trotter ('and half mostly arabian, a little thoroughbred'), that Steph rode on over 3300 miles of endurance (including 9 of 10 100 milers, including Tevis as his first 100), including the 1999 Pan American Championship, the 2000 World Championship in France, and the 2001 Dubai World Cup (aka the 'World's Most Preferred Endurance Race'). 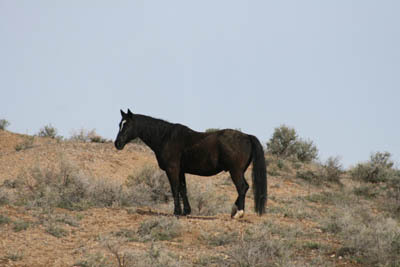 He was the original natural, decisive, and kind herd Big Boss of any horse that passed through the Rancho. He just had to give anybody the Eye and they did what he wanted. When Krusty retired from endurance, Steph gave him to Nance and Bruce Worman. They'd been using him as a riding horse (he still does LD's) and as a teacher for Bruce's daughter Belle. Steph was feeling homesick for her old boy, and she thought he'd make a great herd re-leader with the new mix-mash of horses here, when we turned everybody out together. But that wasn't quite what happened. 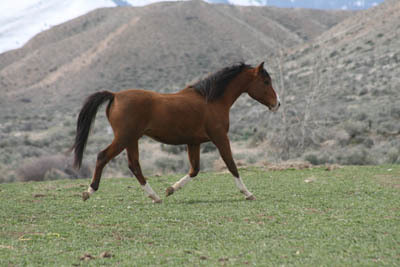 - he hung near the periphery of the Jose herd and followed them timidly around for lack of anything else to do. enjoying the freedom to stretch their legs and run about. 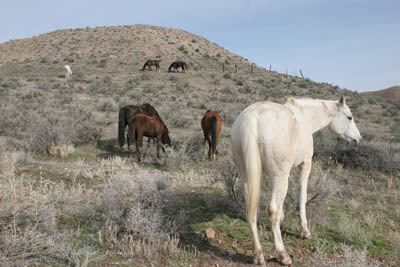 It attracted the Jose Herd's attention, and they came to investigate. First, enthusiastically, came Jose the Social Director. 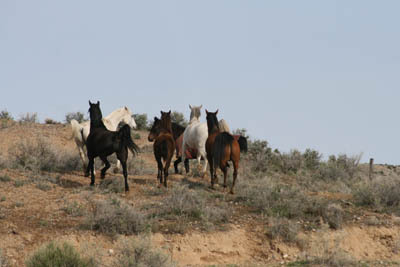 then moved on their separate ways, hanging somewhat together, but still in their separate herds. with Tex staying right close to his pal Stormy. 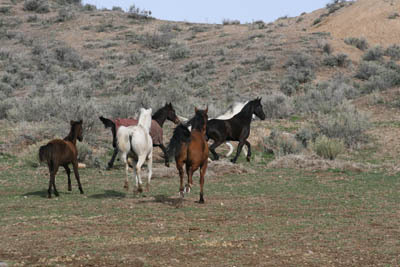 Next, Stormy and Tex met the Jose Herd (who Stormy normally hangs out with) - Mac was again the aggressor! Wouldn't let Tex anywhere near anybody except Stormy. Viciously chased him away from any food or any of his Jose herd. When Stormy horned in to eat hay at the feeder, Mac ignored him (all the horses kindly put up with and humor the old racehorse), but he kept Tex away. Tex had to hang back and wait for the herd to leave so he could eat hay, or for Stormy to leave so he could hang by his side. We kept the two Hoodlums Dudley and Finneas locked up in their big paddock a while - they tend to kick first and ask questions later. 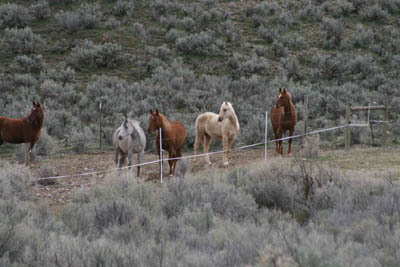 They interacted with the other horses over the wood-rail fence. 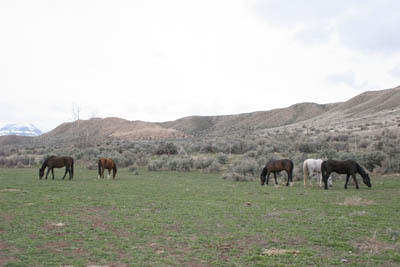 The first day that the three herds - Jose Herd, Stormy Herd and Arizona Herd mingled, they wandered their way down the pasture and on across the creek, somewhat together while still keeping their separate entities. 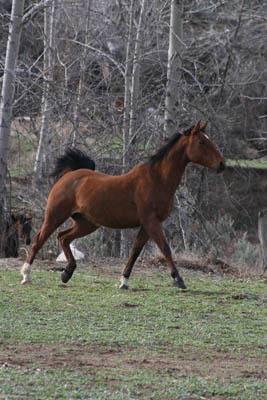 But suddenly, here came Tex, galloping back to the house lickety split. We discovered he wouldn't cross the creek. Must not be any water in Texas! Tex wanted to be with Stormy, but because of that big monster scary horse-eating creek, he preferred hanging close to the house, and in that way he spent a lot of time close to FInneas and Dudley. Dudley and Finneas would act aggressively toward Tex across the fence... but Tex didn't take them too seriously either. Meanwhile, I left for two weeks. 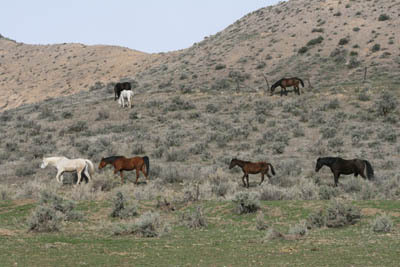 John turned all the horses out together - the 4 herds - during the day a few times, and they still all more or less kept to their same herds, with Krusty staying on the outskirts of one herd or another, and Tex hanging near Stormy - unless they crossed the creek (which now is a raging creek). 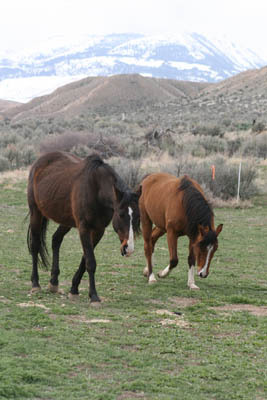 Now, since I've returned to Owyhee, the two Hoodlums and Krusty hang out at nights in the fat pen (Krusty is Low Man on the Totem Pole), and get turned out during the day. 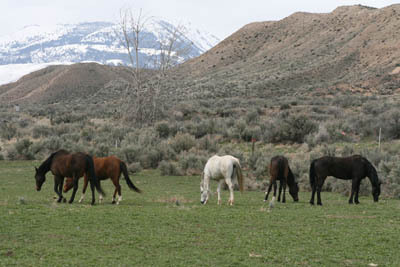 With the exception of the Hoods, the other horses have integrated somewhat into one herd - although they still retain their attraction to their original herds... unless they cross the raging creek, when Tex comes back to hang with the 'Hoods, or by himself near the house. Rhett is back to being the Big Boss, though as usual, he doesn't have to do anything but pin his ears at anybody. Mac still thinks he is the boss, but he won't try anything on Rhett. Jose is still the Social Director. I'll keep tabs on the dynamics. It will be interesting to see if things change, and if Krusty regains his kingly status like he once held. I feel sorry for the old guy. He's been around the world and done more than all these horses put together, and nobody likes him or respects him. He's got a lot of rungs on the ladder to climb, but I'll be rooting for him!